The European Union has produced more than 2.5 billion tons of waste. The management of such a quantity of waste represents a major challenge for European society to ensure sustainable economic development able to combine the economic growth of the states with the conservation of natural resources, health and safety of European citizens. Waste represents an important source of greenhouse gas production, one of the major contributors to global warming. Correct waste management guarantees a lower consumption of resources and helps to reduce polluting emissions. Separate collection in particular, allows to virtually eliminate emissions produced, thanks to recycling and to the anaerobic digestion of the organic fraction of waste, with a negative CO2 abatement cost. Thanks to an increasingly efficient and integrated management of waste the GHG emissions from landfills and incinerators in the EU-27 have decreased by 34% since 1990, registering the highest reduction rate amongst all sectors emitting GHG; furthermore it has been estimated that the separate collection of municipal solid waste in the EU-27 has avoided approximately 47 million tons of equivalent emissions of CO2 in 2008 significantly contributing to the reduction of the request for virgin materials such as paper, glass, plastic. In the past, waste management mainly consisted of collection, selection, treatment and transfer to landfill / incineration. With the development of separate collection recycling and re-use have also established themselves, and today the industry related to waste management is finally focusing on the environmental and economic value of waste. Environmental policies and regulatory frameworks are orienting operators in the sector into choosing to treat the organic fraction of municipal solid waste by coupling the processes of anaerobic digestion and composting. to produce compost which should be suitably treated for its various uses in agriculture and gardening. The production of electricity and heat from the anaerobic digestion of the organic fraction, regarded as biomass by the legislator, has been promoted in Italy with the introduction of convenient electricity sales rates. 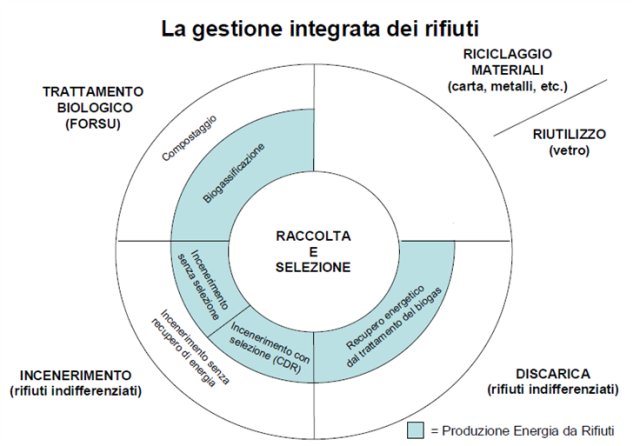 The activities of recycling and re-use of materials, which include mechanical or chemical operations for the transformation of waste into secondary raw materials suitable for re-use in other production processes, now form an important supply source for a significant part of the industrial system; it is sufficient to say that for materials such as paper, steel, lead, aluminium, the percentage of materials used in new products coming from recycling is over 50%. The increasing use of these forms of waste management is transforming the industry’s companies into real manufacturing companies, with their own production cycle and often promoters of significant technological innovation. The incineration process consists in the thermal destruction of waste with no energy recovery whilst waste-to-energy involves the production of electricity and heat. These are highly popular waste management methods in Europe, which have reached such a technological maturity as to guarantee high energy yields in compliance with high environmental standards. Industry experts predict that, despite an increase in the re-use and recycling of materials, a significant percentage of waste will in any case continue to be managed by facilities for the production of electricity and heat (at least 25% of municipal solid waste, to which some types of industrial waste should be added too). Landfilling has been the most widespread system used in waste management for many years, and, even now, is the most popular in our country. Simple landfilling has been accompanied in time by the extraction of biogas deriving from the organic fraction of mixed waste, which is used for the production of electricity and heat. Due to the increase in re-use and recycling, a gradual reduction in landfilling is predictable, and will be increasingly limited to materials that are no longer recoverable in terms of re-use / recycling or energy conversion.